The Satanic Temple invites you to join us for a night of chaos, noise, and debauchery at The Unveiling, a hedonistic celebration introducing the controversial Baphomet monument accompanied by provocative performances and installations. 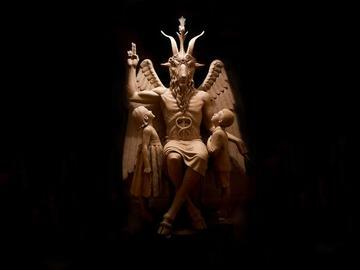 Never before seen in public, The Satanic Temple Baphomet monument is already the most controversial and politically charged contemporary work of art in the world. Weighing one ton and towering at nearly nine feet tall, the bronze statue is not only an unparalleled artistic triumph, but stands as a testament to plurality and the power of collective action. The event will serve as a call-to-arms from which we’ll kick off our largest fight to date in the name of individual rights to free exercise against self-serving theocrats. Come dance with the Devil and experience history in the making. VIP ticket holders will have an exclusive opportunity to be photographed seated on the Baphomet monument, and will receive a limited edition event poster which they can have autographed by Lucien Greaves.